IBM just published its Global Location Trends study, which ranks the most attractive cities for international investment. The study, which focuses on a series of indicators for 2014, places Lyon in the top 10 cities in Europe and in the top 20 cities in the world. The study also highlights an overall growth in international investment in 2014. The top three countries (the US, China and India) remained unchanged. 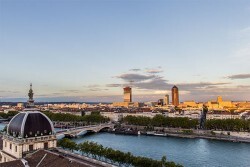 Lyon is ranked 19th in the cities listing, ahead of cities such as Frankfurt and New York. Lyon continues to be recognised at a European level as a “top destination” climbing to 7th place in the list of cities attracting an increasing number of projects, ahead of Manchester. Among the criteria taken into consideration are the volume of international investments recorded, the number of jobs created and the value of the cities’ direct investments abroad i.e. do the companies (that are present in the area) invest in and create employment elsewhere? This IBM study is correlated with the results recorded by Aderly for 2014 (80 companies set-up, creating 1922 jobs over 3 years). This accolade supports other listings that appeared recently concerning Lyon’s performance. The Economist intelligence Unit published its annual list of the best cities in which to live and Lyon features in 30th place in the world and 16th place in Europe. As one of the most realistic and comprehensive studies today, the ‘Global Location Trends’ confirm Lyon’s competitiveness on the international scene.